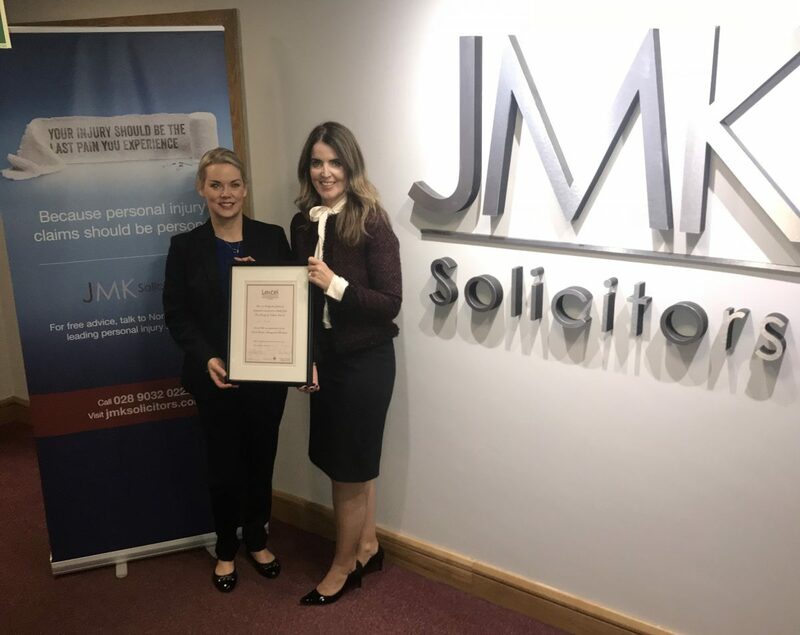 JMK Solicitors are celebrating after successfully completing their annual maintenance visit for the prestigious Lexcel Quality Mark for the legal profession. The Belfast and Newry-based legal firm, who are Northern Ireland’s leading personal injury and road traffic firm, were awarded the Quality Mark, two years ago, following a rigorous assessment process. The scheme is administered by the Law Society and recognises firms which achieve excellence in legal practice management and client care. Maurece Hutchinson, Managing Director at JMK Solicitors, commented “We pride ourselves in putting our clients first and strive to do our absolute best for them, the accreditation is a reflection of this and gives both current and prospective clients the assurance and confidence that they are dealing with a reputable firm that works above the recognised standards. This is a highly prized quality mark and we are very proud to have been assessed so successfully for a second consecutive year. Established in 2003, JMK Solicitors operates from offices in Belfast and Newry, servicing clients from across Northern Ireland. If you would like to contact JMK Solicitors, please call their Newry Office on 028 3025 7766 or Belfast office on 028 9032 0222. For more information, visit www.jmksolicitors.com.